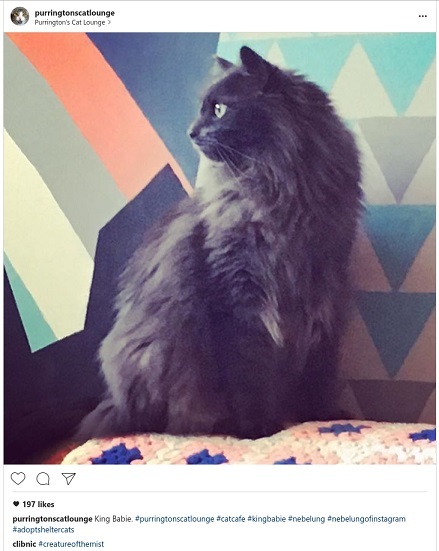 We had the pleasure of sitting down with local business owners Sergio and Kristen Castillo the owners of Purringtons Cat Lounge located in NE Portland. Read on to find out all about their awesome business and how pet ownership can change your home. Can you tell me a little about the inspiration behind your business? We saw a video of a cat cafe in Paris and thought it was such a great idea. Tokyo is known for them probably because people live in small quarters and it is not always a responsible option for them to have pets. Small home dwellers still love animals and cat cafes are a great way to have that interaction. 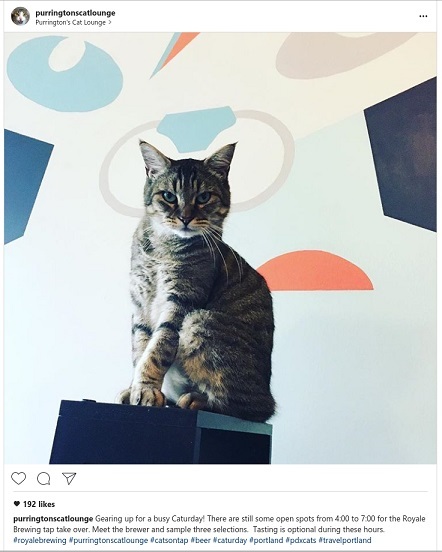 We didn’t really see that as a reason to have a cat cafe in Portland, we more expected it to be good for people who cohabitate with people who are allergic. 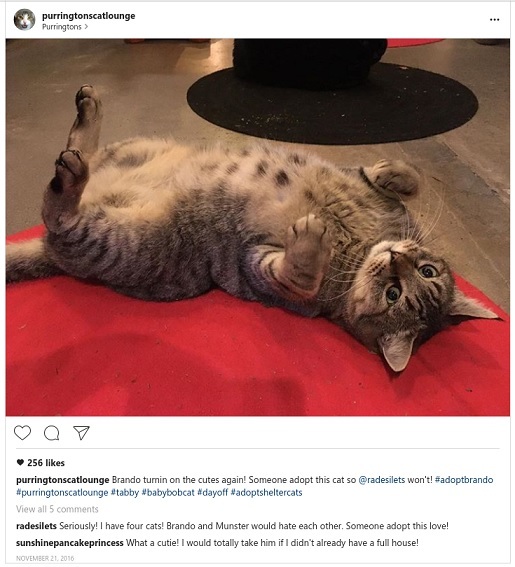 However now, with a lot of changes to the city, our business might also be good for people who don’t feel like their housing situation is stable enough for pets, or with the push for infill we might find people have less space in their homes and the cat cafe is a good alternative. People often are forced to surrender animals to shelters because of their health or finances and it is such an insult to injury to have to lose a source of comfort during a stressful time and it is awful for the pets to have to be in a shelter and away from their family. 2. While we are on the topic of rent increases and changes, what effect does that have on pets? We haven’t seen too much of it yet, but we imagine with the rapidly increasing rents in Portland and property owners being more restrictive with their rental policies we will probably see an increase in owner surrendered cats to shelters. As people get priced out of their apartments they must seek new places to live and in a market with so many renters willing to pay well owners and managers can be very selective and often place restrictions on pet ownership for renters. People are charging rent for cats now. This puts people in the difficult position of having to choose between a beloved pet/family member and the practical necessities of having a place to live that suits their needs. That’s the benefit of being a homeowner. If you own your home you can do whatever you want, and a house is not really a home until you have a cat. 3. Speaking of cats and homeownership when we first spoke you sent me a hilarious video tied to a tradition in Russia related to home purchases and cats. There are many beliefs about cats around the world and I think the one in Russia is that a cat entering through the threshold is good luck. One mortgage company capitalizes on that and has new homeowners pick out a cat to adopt that they bring to the home when their agent gives them the key. The cat is supposed to enter the house and it is lucky or a sign of a good home. I think that is a little too much pressure for a cat, though. They shouldn’t be forced to provide goodwill or a good vibe for your house. They would just do that anyways without any sort of preconditions because cats are awesome like that. What if they don’t want to enter the house? Do people back out of a transaction? Does it mean that something is wrong with the house? Maybe some cats can double as home inspectors. We adopted out a cat that knows when the diabetic child in his family has low blood sugar, maybe some cats can smell dry rot. I don’t know about adopting cats out with houses though because you don’t know if sensing a good purchase will be one of that cat’s special skills. All jokes aside, though, a house really isn’t a home without a pet. 4. How do you help a cat get settled into a new home? It takes cats some time to acclimate to a new space. At Purringtons we did a big build out, so when we first moved cats into the cafe they were really staying in back in the area that guests don’t spend time in and we got a little worried. I think the construction smells in the cat lounge were not really inviting to them. Once there started to be people here and other smells, like brewing coffee, they started to venture out into the cat lounge. I think it is probably a similar experience getting a cat settled in a new house, or after a renovation project. Give them time to adjust to changes, they are so sensitive to ambient sounds and smells. Newly adopted animals can take a long time to be fully settled in and you can expect the process to be even longer when there are other animals in the family. As a homeowner, you can help the transition by enriching your space for your cat, making it more stimulating and inviting. Shelves mounted under window ledges so that your cat has a good vantage point, catios so they can get fresh air and take in the outdoors; there’s a lot you can do for making your house fun for kitties. Keeping them busy with toys and designated areas is also a great way to minimize damage to your home. Entertained cats with access to appropriate places to scratch like posts are less likely to scratch up furniture and home fixtures. 5. You mention Catios to keep your cat entertained. Can you elaborate more on your opinion of indoor or outdoor for pet cats? In Portland, we have urban coyotes on top of all the normal dangers to pets outside, like cars and inclement weather. There have even been some frightening reports of people hurting other people's cats. If you want your pet to be safe, we recommend keeping them inside or using a catio to let them explore the outdoors without the risk. Don’t let your cats roam outside because the lifespan for an indoor versus an outdoor cat is considerably longer. Of course, everyone knows an exception or two to that rule, but you have no way of knowing if your outdoor cat will be one of the lucky few that live to an old age without incident. It’s our policy to only adopt cats at the cafe out to homes that will keep them indoors because we want to keep these animals we care about safe. We recommend homeowners consider a catio as a great option that might not be available to renters. 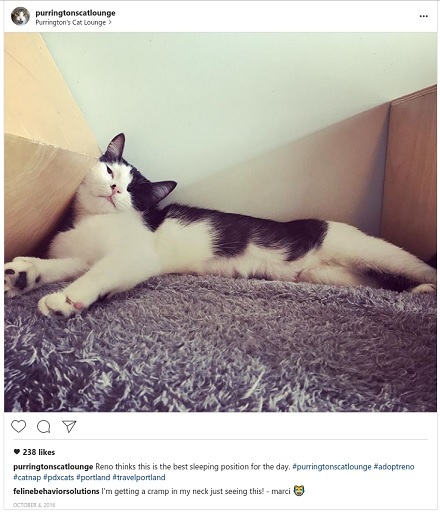 There are some great companies around town that install them; a lot of their work is featured in the Catio Tour hosted by the Feral Cat Coalition if you want a preview before you commit. They can be as simple or as elaborate as you would like, but either way, your cat will enjoy the option to go outside safely. Bonus question 1. As much as a cat is an excellent addition to a home they can also wreak some havoc on a house. Any advice for homeowners eager to have a pet and not damage their wood floors? One of the behaviors that can cause the most damage to a home is inappropriate urination. If your cat is urinating outside of the litterbox there is usually a reason. It may be health related, like they have a UTI, or maybe you are not keeping their box clean enough, or it is in a location they don’t like. Don’t be discouraged if you struggle with this with your cat, just focus on figuring out what is causing the behavior so that you can fix it and your home's floors will stay beautiful. All behavior has a cause, so if you are experiencing a behavior from your cat that may cause damage to your home don’t give up on your pet. You can find out what is causing the behavior and address it so that you can have both a lovely home and a happy pet. 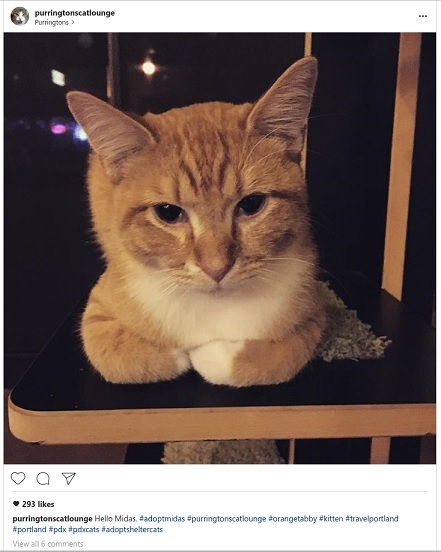 If you ever find yourself having a rough day, I recommend you browse the Purringtons Instagram for some uplifting images of sweet kitties loving the cat cafe life and finding forever homes. Don’t forget to friend Purringtons on Facebook and bookmark their website to keep up to date on all the events they host! You don’t want to miss a movie night, wine tasting, or yoga with cats. If you are ready to find a forever home for a kitty we can help; No matter what stage of the process you're in, we are happy to assist you finding that perfect corner for your furry friend’s scratching post.